To pay tribute to its history, Peugeot has designed an exclusive collection in which each traditional Peugeot pepper mill brings back the charm of vintage patina. Manual pepper mill in aged wood 10 cm - 4in. The long history of Peugeot mills has always been built on a harmonious balance between past and present, between tradition and innovation. That's why Peugeot has designed an exceptional collection in which each traditional Peugeot pepper mill is hand-crafted from PEFC-certified beech wood from European forests, supporting sustainable forestry management. Following the classic lines of Peugeot mills, with their understated, clean forms and antique finishes, the Peugeot traditional pepper mill benefits from all Peugeot's ingenuity and historical savoir-faire in the manufacturing of steel, with high-quality, high-precision efficient mechanisms guaranteed for life. 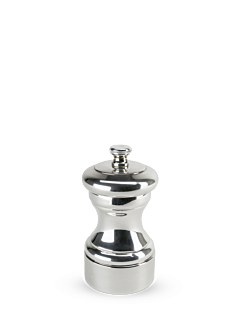 The Peugeot traditional pepper mill defies the passage of time and changing fashions. It fits easily into the most classic and most contemporary interiors, and is as functional in the kitchen as it is aesthetic on a table or an ultra-modern piece of furniture, defying convention.